What makes our restaurants just so special? The staff of course! Passionate about food, creative and committed to delivering quality, they are what make our kitchens tick. Across our sites our restaurants reinforce just what a wonderful thing a positive spend is – the more food they sell, the more money is ploughed back into the organisation to support the very people who need our help most. 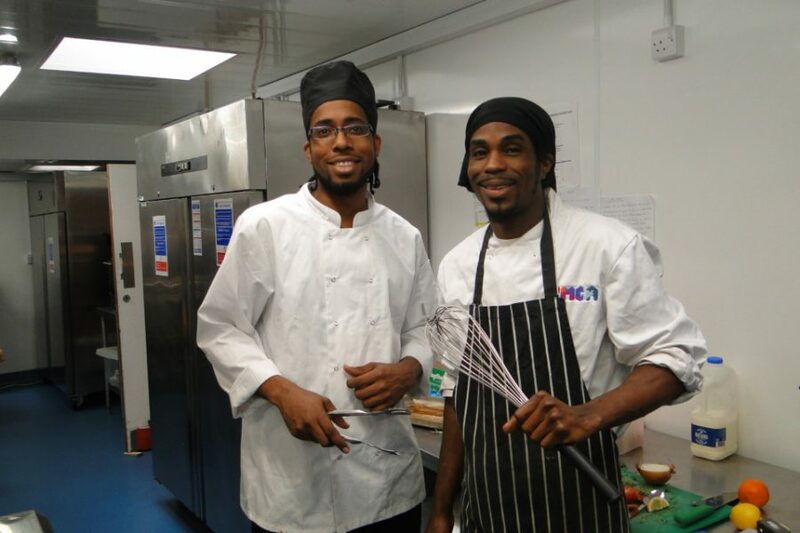 At YMCA Wimbledon, Andrew Smith is the head chef who joined the kitchen three months ago. He has been a chef since he was 16. The military history in his family was a strong pull (his father and uncles were in the armed forces), but a family friend helped get him established as a chef in a small hotel in Ayr, and from there he took off on his career. “A good friend of my father’s, Andrew Mason, took responsibility for me when I my dad passed away when I was 15 and I owe everything to him. He suggested that I train to be a chef. He organised my first interview for me and I took up a position at a hotel in Ayr, right near the promenade and beach. “My favourite thing to cook is fish – it’s great to cook with and you can present it beautifully. If I were to walk into any restaurant, I would always order fish to eat – healthy, fresh and delicious. Al Kolley is the Catering Manager at YMCA East London and runs a busy restaurant which is open to the public and the hostel residents from 7.30am until 8pm. He started training to be a chef at college in Cornwall, then moved to London to study hotel management. He was part of the team that set up the prestigious Conran restaurant Pont de la Tour, as well as top London hotels the Savoy and the Landmark. “I still cook here, and get involved. I actually ran the whole restaurant for 6 months in the beginning with no chef! I have set high standards here and want to keep them in place. “We do resident’s breakfasts and the public join us for that; it’s a continental style, no fry ups. For lunch we open from 12pm-2pm and the public can come in and out throughout the day for snacks and tea and coffee. It’s one of my aims to develop Brunch for the public, but we aren’t able to do that yet. So between 10 am and 12pm is an area that I want to develop. “At lunchtime we have a soup and a roll, all home-made, plus a meat dish, fish dish and veggie dish as well as a pudding. The reason I put together a menu like that is to give people more options and it’s healthy. We also have salads and jacket potatoes and sandwiches, too. Supper runs from 5pm-7pm for residents and the public. Anyone can come off the bus and in here to eat. “I’m usually here at 6.40am and finish at 3pm or 4pm, and then alternate weekends too. We’ve got three chefs, and two general assistants who look after the front of house. My biggest challenge is keeping the washing area clear and clearing the restaurant. But we all jump in to help out. “Making the restaurant profitable is difficult as you have to be mindful all the time that the food you’re serving isn’t too expensive to buy in. You have to be careful with your menu planning and cost planning. It is one of the key difficult areas – you don’t want any waste and you have to push your suppliers for the best prices, and my experience and background means I know all the tricks to get the best prices. Miguel Pestana is the chef at YMCA White House in Hampton and has worked for the Association for 10 years. His first job was kitchen porter at YMCA Surbiton and he has worked his way up from there. “Before I came here I was a builder in Portugal but soon realised this wasn’t what I wanted to be doing, so I moved here and got a job at YMCA Surbiton. I’ve always been interested in cooking, I love to eat! So I love to cook. I’ve learnt to be a chef on the job with the chefs at Surbiton. “My days here are 7.30am-3.30pm and I work shifts at the weekend. I don’t have any staff in the kitchen; I run this kitchen all by myself. But we have a great team here in the café and the centre, and we all work together. I have to also order all the food in, too. As the kitchen grows and develops, we should be able to employ more staff, but at the moment on busy days it is quite challenging. “I think the most difficult part of the job is to plan and not waste food, as the restaurant will lose money. So I need to use all my experience and tricks of the trade to ensure that doesn’t happen. “The most popular dishes here are the Sunday roasts as we cook with very good quality beef while lasagne is also a favourite, as is cottage pie and shepherd’s pie. People seem to love my leek and chicken pie! Even the curry goes down well. I learnt how to make that with a Malaysian chef, and I always do it her way. “My favourite food to cook is Italian food, anything with pasta, fish and grilled meat. If I were to choose a dish to eat, it would usually be steak, but I also love pasta.